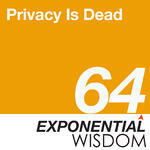 Peter and Dan discuss the idea of privacy and how it is a recent human invention. A thousand years ago, people didn’t assume the level of privacy we enjoy today. Do we assume privacy is a right, when it never existed? Peter discusses how wrongdoing becomes harder in a world without privacy. When everyone is watching, you’re more likely to think about the consequences of your planned actions. Dan believes blockchain will become ubiquitous because of public demand. He outlines a future business model in which companies that make money on someone’s personal information will pay users a small percentage of the profits their data earn. Peter discusses a future scenario with an AI software shell that watches everything all the time. As owners of this technology, we will give it permission to watch us and collect every piece of data on us so that it can make decisions that improve our lives.